It's Ed Whitacre's GM now. By accepting the resignation of CEO Fritz Henderson, the board chairman, Ed Whitacre, puts himself squarely in the driver's seat at General Motors. Auto-industry insiders like to think of their business as impossibly complicated, involving as it does billions of dollars, intricate technology and the necessity of gauging consumer tastes three or four years in the future. By their reasoning, developing the necessary expertise takes decades of experience. No outsiders need apply. Former Boeing executive Alan Mulally has partially disproved that theory by leading Ford to the greatest success among the Detroit Three. Now GM board chairman Ed Whitacre, a veteran of the telecommunications business, will try to go the rest of the way. After accepting the resignation of GM veteran Fritz Henderson, Whitacre will be running the company as interim CEO while he searches for a full-time successor. Who wants to bet he picks an outsider to fill the job? Henderson will be remembered as being as smart and experienced as any GM CEO, but he appeared tone-deaf when it came to listening to Whitacre and the rest of his board of directors. Since he had no role in picking them and they owed him nothing, that proved to be a fatal mistake. When the board made it clear that it wanted Henderson to replace chief financial officer Ray Young, Henderson dawdled. He could rightly complain that government curbs on executive pay made it difficult to recruit experienced financial executives, but it must have looked to the board as if he couldn't make a decision or was simply stalling. When the deal to sell part of GM's Opel to parts supplier Magna began to lose momentum, Henderson failed to gauge the depth of the board's sentiment that GM keep Opel as a strategic asset and he remained opposed to doing so up until the very end. 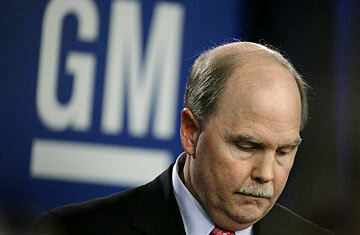 That left him crossways not only with Whitacre but also with the German government  an embarrassing place for GM to be. Henderson also had the bad luck to have several deals blow up in his face. Entrepreneur Roger Penske walked away from an agreement to buy Saturn because he couldn't find anyone to supply him with cars, forcing GM to close the division. And just last weekend, a deal to sell Saab to Swedish investors fell apart, leaving GM once again with a distressed property and no obvious way of disposing of it. An old discredited GM slogan for one of its former car brands insisted that this wasn't your father's Oldsmobile. Shortly thereafter, GM pulled the plug on Olds. Whitacre has served notice that "this isn't your father's GM" anymore. All of the auto world will be watching to find out what kind of GM he wants it to be.  Alex Taylor III is a senior editor at Fortune magazine, where he has covered the auto industry for 23 years.